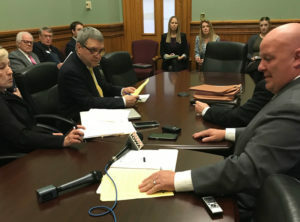 A bill that would increase penalties against those found guilty of mistreating companion animals in Iowa has unanimously cleared the House and is now under review in the Iowa Senate. Tom Colvin, CEO of the Animal Rescue League of Iowa, today said the bill will help county officials who have to prosecute these cases. “It does a number of things that go to the issues that we’re seeing around the state, unfortunately with more and more frequency — very egregious acts of animal abuse, neglect and torture,” Colvin said during a Senate subcommittee hearing. Haley Anderson of Iowa Voters for Companion Animals told senators Iowa is one of only two states that does not classify a first-time offense of animal torture as a felony and this bill would change that. The House last week unanimously passed the bill. It’s among several bills that have been introduced on the topic, including one that specifically addresses what critics call “puppy mills.” Agricultural groups have in past years have argued tougher animal cruelty laws could create new regulations for farmers and might be hijacked by animal rights groups intent on shutting down livestock operations.